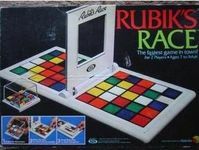 Last we have Rubik's Race, which is a real-time game in which players compete to make a given 3x3 pattern in the center of their board. This is the original edition from Ideal. The box has a fair amount of wear. A few pieces have small marks but they're fine overall. The board has some wear and one of the six rubber feet is missing. Sweetener: the conceptually similar Square Off by Alex Randolph. 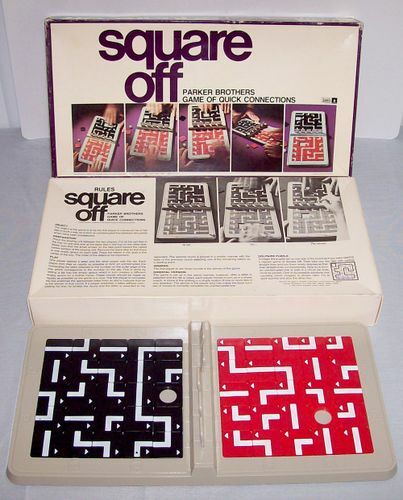 This is also a real-time sliding-block game but here players try to connect two edge spaces. This is also complete with minor piece wear. The box also some wear and a corner of the insert (which is just a flimsy spacer) is torn off.